Clone Wars Chewbacca is a meat shield character. Let’s take a look at what he has to offer to your team. 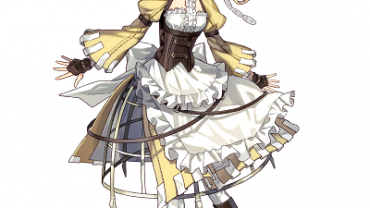 Basic Ability: Bowcaster – Deal Physical damage to target enemy with a 40% chance to remove 50% Turn Meter on hit. 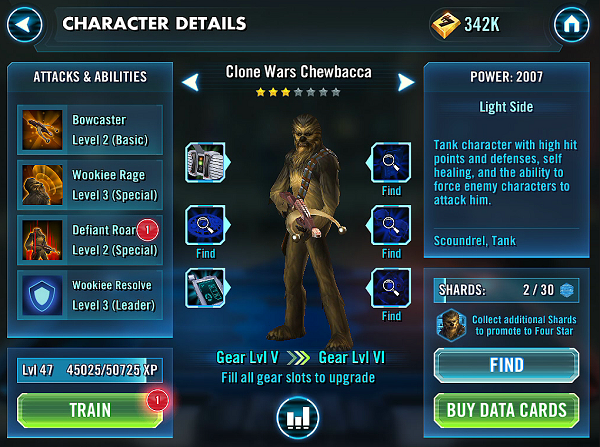 Special Ability 2: Defiant Roar – Chewbacca recovers 40% of his Max Health and gains Defense Up for 3 Turns, with a 50% Chance to gain 25% Turn Meter. Leader Skill: Wookiee Resolve – All allies gain +50 Defense with a 50% chance to gain Defense Up for 2 turns when attacked. Clone Wars Chewbacca is actually very underrated and a decent tank if used correctly. Chewbacca has a self heal at 40%, which is quite a bit of health recovery. His physical attack is average at best. His taunt might only be one turn, but it is a life saving skill if you use it when your damage dealers are about to go down. With a healer or two, Chewbacca can be very annoying to deal with. The only way to take one down is to burst him with tonnes of damage, which most arena teams have. If we were to compare him and Poe Dameron, I think Poe will win if used in the arena while Chewbecca will shine in regular campaign maps. It then becomes a matter of where you are fighting. Verdict: Only level if you find a use for him. on your team. So what exactly does 15% harmful effect chance even mean? It has no description to what it does exactly…does it add a harmful debuff or something?